The mothership of South Africa’s parks, Kruger is more organised and has more variety of accommodation than any other park. It also has a HUGE number of animals with the Big 5 and every other kind of 5 you can think of rustling around in the bush. Kruger also has a sublime beauty that changes in different sectors - in general the north is the wildest section. Yes, it could be called Africa for beginners, however it also has wilder offerings, such as bush walks in some beautifully scenic and remote areas. When I entered the park for the first time, I was greeted by the sight of two dwarf mongoose mating by the side of the road - they didn’t even look up. Next I saw a huge herd of impala, and couldn’t believe my luck, what a sighting! Two days later when I was leaving I whizzed past a herd double that size without a glance...so many animals glimpsed elsewhere are so common here. Sadly, rhino poaching has again become a major problem in the park - 252 rhino were slaughtered in Kruger for their horns in 2011. In early 2012 the park was devastated by floods with chunks of road and bridges washed away - most roads and facilities have reopened but picnic sites such as Tshokwane had serious damage and will be closed for a long time: check with staff at the gate you use to enter the park. I love the Kruger. But I admit that this sometimes puts me in a minority. Many safari purists scorn the tarred roads and large public camps of South Africa’s premier park as a travesty of ‘real’ wilderness. And they have a point: the heavily developed infrastructure can feel intrusive and certainly attracts hordes of visitors. Nonetheless, this huge park – the size of Israel – has space for all comers: while the masses fill the larger public camps, those seeking a more unspoiled bush experience can enjoy the remote back roads and bush camps. For the independent, self-drive traveller, this is the most accessible and cheapest of Africa’s major safari parks. But there are also numerous top-notch private lodges, both within the park and in private concessions to the west, to cater for those seeking a more exclusive safari. Either way, the Kruger’s scenery and wildlife are outstanding. A rich spectrum of habitats, combined with perennial rivers and all-weather roads, makes for great year-round wildlife viewing in some spectacular landscapes. There is little I haven’t seen in this park, and all of it – from cheetah kills to wild dog dens – enjoyed from my own humble vehicle. The central savanna regions hold the greatest game concentrations, while the far north is best for birding. In general, the further north you go, the wilder it gets. For a serious wilderness experience, you can’t beat the three-day guided wilderness trails. Conducted far from any public area, these have brought me memorable on-foot encounters with all the Big Five and a real insight into the secrets of the African bush. The first time I went to Kruger as a small child, I remember being profoundly shocked. This was a game park but not only did it have tarred roads (not all of them – just the main ones) but there was even a railway line running through the middle of it! Since then, Skukuza, the main camp, has grown from a busy park into a bustling small town. If this frightens you, stop, draw breath and don’t worry – Kruger is unlike any other national park on the planet. For a start it is quite literally the size of a small country – about the same size as Wales or Israel. It covers around 20,000 sq kms (7,722 sq miles) and stretches 353 kms (219 miles) from north to south. It is by way and far the largest in South Africa. When the Great Limpopo Transfrontier Park is complete, the Kruger will be incorporated into a giant 35,000 sq kms (13,514 sq mile) reserve in South Africa, Zimbabwe and Mozambique. In addition, around the edges of Kruger are numerous private concessions and game farms such as Sabi Sands and Timbavati, home to some of the world’s most luxurious lodges, with animals wandering freely between the park and the private lands. This, then, is wildlife equivalent of the motherload, the giant jewel in South Africa’s crown. It’s just left to decide where to go and where to stay. There’s too much choice. Kruger is lowveld savannah country – the edge of the escarpment is just nearby, easy daytrip distance and stunningly beautiful (well worth a detour). Roughly speaking, the park is greener and lusher in the south and hotter, drier and with sparser vegetation in the north, around the Hoespruit area. There are far fewer people in the north if you want to get away from other tourists. If you have the time, try and do a couple of nights in the south and a couple of nights further north, as you do see different animals and birds. There’s a huge array of accommodation at all price ranges, both within the park and around the edges from humble family-friendly motels and chalets to world-class luxury hideaways with price tags to match. There really is something for everyone here. The nearest international airport is Johannesburg, about 5 hours drive west, but there are regular internal flights from Jo’burg International to Skukuza and many of the luxury lodges also run their own private charter flights. If you’re a safari newbie with time to visit just one South African national park, make it Kruger. The main reason I like this blockbuster park is that it has a superbly democratic feel. It’s straightforward to get to, there’s a great deal to see (including the Big Five) and, crucially, there are plenty of different ways to explore, not all of which involve shelling out vast sums on extravagant accommodation or luxury services that may not be to your taste. If you’re independent-minded, you can just drive yourself around and sleep in a simple self-catering restcamp. There is a downside, though – it’s tremendously popular. At 414km long, Kruger is vast, but parts of the park can feel decidedly crowded during the South African holidays. If you hate the idea of being stuck in a traffic jam on a tarmac road – albeit a tarmac road through the bush – then you’re best advised to visit off-season, or head for one of the remoter sections of the park. As a long-time South Africa resident, I can’t but love Kruger. I’ve been to Kruger many times, sometimes as a guide, sometimes as a photographer and maybe once or twice as a tourist. At the ‘wrong’ time of the year, Kruger National Park can be frustrating. In summer the bush is thick and animals are dispersed. Driving around for hours on end without seeing a thing is not a rare occurrence. That is if you’re not into birding, because at this time with all the summer migrants in place, birding is excellent. South Africans know that winter is the best time to go to the bush, and fortunately for us, this coincides with the tourist low season. What I love about Kruger is the size of it. Being the size of a small country, you can drive around for weeks without a feeling of going around in circles. Not long ago, I did a 2-week trip through the Park, starting in the south and ending in the far north. On every day, there were long drives where nothing much happened, but at the end of the two weeks I could look back on some very memorable wildlife encounters. Kruger is not the best destination for a quick visit to tick of the big five. You should go to the adjacent private reserves for that. Kruger is about getting in the rhythm of the bush, about taking your time and enjoying the feeling that this is a real ecosystem with everything in place. You might see anything here, but you shouldn’t take any of it for granted. The most accessible south of the park has some of the best wildlife viewing circuits, but is also the busiest with tourists. I love the more remote central part of the park with its open plains and the scenic Olifants River. Very few tourists head up to the real north, so this is the place to go for exclusivity. Wildlife densities are lower in this part of Kruger, but when you see something you have a good chance of having the sighting to yourself. Quite a new development in Kruger is the private concessions within the park that offer an exclusive luxury safari similar as those offered in Sabi Sands. South Africa’s largest park most certainly fulfils most visitors’ expectations of seeing magnificent herds of game roaming across acacia-studded savannah. After countless visits at different times of the year, I have found it can get a little crowded in peak holiday times, and sharing a view of a lion pride with several other vehicles is not ideal. But then it’s always been easy enough to explore the quieter roads away from the major tourist routes too. There’s so much game in Kruger, animal sightings are virtually guaranteed, and on my last visit I was lucky enough to spot all of the Big Five in one morning along the Sabie River. Some camps such as Skukuza and Satara are like small towns, and along with tarred main roads, this takes away the wilderness vibe somewhat – but other camps are beautifully remote with just a few peaceful rustic cottages hidden in the bush. In short, the greatest appeal of Kruger is its varied characteristics and choices, and it’s equally suitable for a day visit as it is for a multi-day safari. First-time visitors will get through their tick lists with ease in the southern part of the park, while seasoned safari-goers will enjoy seeing animals and birds in a wilder environment in the remote north. Kruger is truly the king of wildlife parks. Around 150 mammal species, including 1,500 lions and the rest of the Big Five, inhabit this 350km-long chunk of bush. It’s also extremely convenient, with its tarred roads and camps both inside and outside the park gates, but it can get crowded. The southern section, which is both frequented by predators and closest to Johannesburg, is particularly busy. The quieter north has dramatic, baobab-studded landscapes, but you often need to be patient to spot animals there. Throughout Kruger, escape the crowds by visiting at a quiet time (such as late January to March) or by hitting the bush on foot, accompanied by armed rangers. I went on a half-day walk, which was a great way to experience nature and learn tracking techniques. When we encountered a herd of elephants in a forest glade, watching the huge beasts grazing was an electrifying experience. Die-hard safari enthusiasts may disagree, but I think South Africa’s Kruger National Park deserves a place in any top 10 list of safari destinations in Africa. It may not be as wild or as iconic East Africa’s Serengeti or Masai Mara, but it certainly ticks all the right boxes when it comes to a first-timers’ experience of the Big Five. Even with only a few days at your disposal you’d be almost guaranteed of seeing elephant, buffalo and lion. 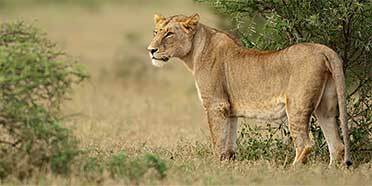 On my very first day in the park on my very first visit to the park, a night time game drive yielded another first for me – my first sightings of lions. Three of them, so close to the vehicle I felt I could reach right out and touch them. Since then, the park has provided many more magical moments with each subsequent visit. The park itself is massive and is characterised by a tangle of dense acacia scrub which means you do need to look harder to find the wildlife. So to get the best out of the experience, I’d recommend you plan your visit during the winter months when the game viewing is the best. And if you want a deep-bush experience, then I’d suggest you head to the northern section of the park, right up to the border with Zimbabwe and Mozambique which is less touristed and less developed than the southern section of the park. Some are critical of Kruger's popularity and network of tarred roads that facilitate self-drive safaris. But the park is so vast that in all but the busiest of times (South African school holidays, specifically), you can still drive for a while and only see a smattering of cars if you choose your route carefully. Southern and central Kruger are busiest but even here, if you tackle a dirt road, you can escape the throngs. Glimpses of all the Big Five are common, though you generally have to share them with other safari-goers, with queues of cars often forming for a lion or rhino. The park offers a range of landscapes as varied as its wildlife and accommodation options demonstrating similar variety. High on my to-do list is one of the park's multi-day guided walking trails – an unrivalled way to experience the bush and a way to assure some alone time. The Kruger Park is such a vast entity that it is difficult to summarise in a few lines. The most accessible and by far the busiest part of the park is the southern quarter, which generally offers the best game viewing, particularly in the vicinity of Lower Sabie and Skukuza rest camps, where all the Big Five are common, including white rhino. However, this is also the most congested part of the park, particularly over school holidays, and this often detracts from the experience. By contrast, the far north has seen limited tourist development and it is relatively quiet, both in terms of tourist traffic and general game viewing. The central region, around Satara, Olifants and Letaba rest camps probably offers the best compromise between good wildlife – the Satara area in excellent for lion and cheetah, while elephant and buffalo are very common around Olifants – and a relatively untrammelled feel. A big asset of Kruger for budget conscious travellers is the affordability of huts and campsites, and a well maintained network of roads that can be driven in a cheap rental car. The wet summer months offer significantly poorer game viewing than in the dry season (Mat-Sep) but the birdlife is utterly magnificent in summer, with loads of colourful migrant bee-eaters, rollers and raptors supplementing resident species. 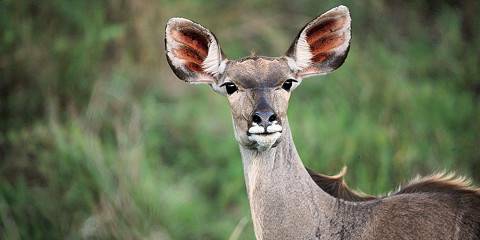 Love it or hate it, Kruger is one of the most popular safari destinations in Africa. You might hear safari purists lambaste South Africa’s premier national park for being ‘a glorified zoo’ with its paved roads and too many people, but there is good reason for Kruger attracting the safari hordes and I would caution jumping to conclusions. I personally like this park and think many of its critics are way off the mark. Kruger is accessible on any budget with much to offer the wildlife enthusiast and by visiting outside the school holidays and concentrating on the less popular northern sector of the park, visitors can easily escape the traffic jams that periodically clog the predator-rich south-central region. Kruger is after-all the quintessential Big Five safari destination with large numbers of all the most sought after and charismatic wildlife species, including wild dog, cheetah and more. 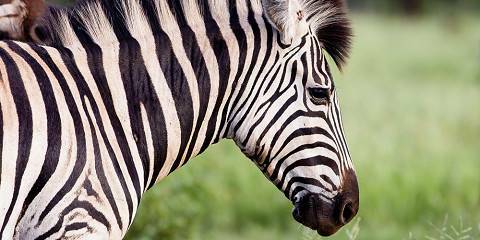 Budding photographers will also like that the animals are extremely habituated and relaxed around vehicles, providing plenty of great opportunities for you to hone your photographic skills. Rather than complain about the paved roads or traffic, leave your car at a rest camp and join a qualified ranger on a guided night drive or escorted bush walk to track wildlife on foot. You won’t see another vehicle or person on these nature activities and, within seconds of setting off, you’ll feel that (previously absent) sense of wilderness wash over you like a soothing balm. I think the Kruger is a great, accessible and not-too-pricey option for first-time safarigoers and more experienced game viewers alike. It’s great fun to self-drive and even small, non 4x4 hire cars can manage most of the roads in the more accessible southern section. However I strongly recommend taking the game drive option available at the park rest camps – the driver/guides are much better at spotting game than most of us and on one trip I was rewarded with a leopard sighting I definitely wouldn’t have had on my own. Kruger’s accommodation options are brilliant and very affordable if you go self-catering, with lots of facilities like cafes, shops and barbeque areas, and the game is abundant and very habituated. Of course, all this means the wilderness feeling is largely absent unless you book a walking or mobile safari, which go into less-visited areas in the north of the park. This world-famous wildlife stronghold is now part of the Great Limpopo Transfrontier Peace Park that also includes the adjoining Gonarezhou and Limpopo national parks in Zimbabwe and Mozambique respectively. Covering nearly 20,000 sq km of sub-tropical lowveld, the Kruger is home to more than 500 bird species and 147 mammals – more than any other African park. 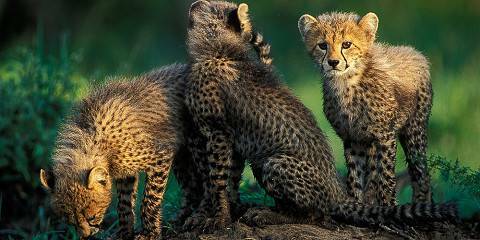 All the big five are included, together with cheetah and wild dog, making this a top destination for predator- spotting. But pride of place must go to the Kruger elephants and in particular to its legendary tuskers. This corner of Africa has always been renowned for producing bulls with exceptionally heavy ivory. The most famous became known as the Magnificent Seven and included Mafunyane whose tusks were so big they dragged on the ground. Sadly, all seven have all passed on, but you can see their tusks in the elephant museum at Letaba Camp in the middle of the park. Kruger’s rest camps and tarmac roads were designed more for the South African market rather than for overseas visitors; but you can still see what the country looked like a century ago if you visit the Makuleke concession at the northern end of the park. This is the Kruger at its emptiest and wildest, where the tarmac runs out, leaving nothing but elephant trails winding into the hidden gorges of the Lebombo Hills. Kruger is one of Africa's best-known and most visited parks. Wildlife is abundant, species variety is excellent and facilities are well developed. If your aim is guaranteed animal sightings, including of the 'Big Five', with a minimum of hassle, Kruger is an excellent destination. Kruger is also a fine family destination. Most of the camps have ample running-around space (some also have swimming pools) for children to get their energy out after a long day in the car. Access is easy via plane or paved road, and there is an extensive and well-maintained network of camps. The downside, of course, is that it will not be a solitary or bush experience. Especially during the South African school holidays, Kruger's camps get extremely crowded; early bookings are essential during these times. For more solitude, I'd recommend considering the private wildlife reserves around Kruger, either as a stand-alone destination, or in combination with a self-drive itinerary in the park. When it comes to wildlife, Kruger National Park, South Africa’ showpiece park is very hard to top. It’ got all the safari favourites in abundance (although at the current rate of poaching I might need to revisit that statement in regards to rhino pretty soon – Kruger is suffering more than most parks from the curse of poaching) and they are all easily seen. I have seen huge herds of buffalo, lion that are so nonchalant about cars they almost walk into them and I once had a memorable evening game drive where a group of baby hyenas started chewing the tyres of my car (funny at first but less funny when they punctured the tyres!). This is also an ideal self-drive safari destination and there’s no shortage of cheap, good value accommodation (as well as some resplendent places in the private conservancies surrounding the reserve). All this makes Kruger an ideal first safari destination. However, the ‘wilderness’ factor for me is almost non-existent. The numerous man-made waterholes used to attract animals didn’t bother me but when I drove around a corner going a tiny bit (honestly officer!) over the speed limit and got stopped by two policemen, chilling out in deckchairs listening to the radio, and given a speeding ticket it rather reduced the whole experience from ‘pristine African wilderness untouched by the hand of man’ to little more than a gentle Sunday afternoon drive around Longlet safari park (a famous safari park in the UK). You can't escape it – Kruger National Park is the most popular in South Africa and one of the most visited in Africa. Thousands of visitors flock here every year for Big Five encounters, the huge variety of accommodation, and the promise of everything from self-drive, to walking, to riding, to jeep safaris. Of course this all means that it can get pretty crowded, and the ease of driving along paved roads can detract from some of the ‘adventure’ feel, but it is still possible to escape the crowds. A game drive during my last visit yielded a morning free from other vehicles, and I had a close up encounter with a wounded male lion all to myself. Driving out of the park in my own car, I saw few other tourists but managed to spot elephant and giraffe and experienced a buffalo roadblock. Kruger belongs in the elite of African wildlife parks and experiences. At once a byword for abundance and hugely accessible, Kruger is a brilliant place for first-time safari-goers. The infrastructure of paved roads is classic South Africa, and there are numerous guided activities, and excellent accommodation to suit a range of budgets. Ample opportunities also abound to follow quiet, unpaved roads through cheetah-rich plains or riverine woodlands. On one such drive, amid the clamour of high season, I spent a blissful half hour alone with a young leopard, then watched hyenas emerge from their den beneath the earth. Perhaps needless to say, the wildlife here is peerless – Big Five, big cats…everything here seems writ on an epic scale. The park’s north is the highlight for birders with plenty of northern specials you just don’t find elsewhere in the country. Other highlights, if any were needed, include soulful baobabs, serpentine river systems and the chance to spot everything from honey badgers to Sharpe’s grysbok.